Non-toxic, non-hazardous, and bio-based chemicals from Envirofluid were used to clean trains at KiwiRail. 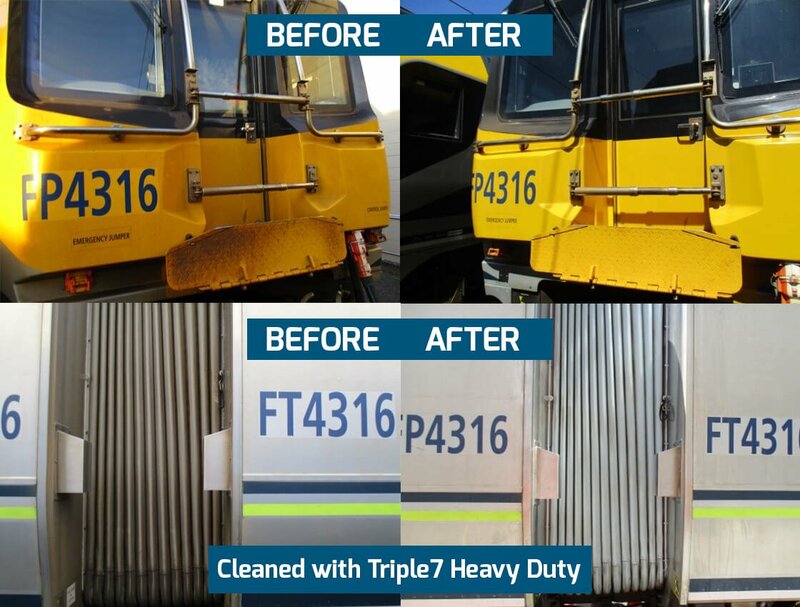 Both Triple7 Heavy Duty and Triple7 Enviroscale Plus proved to be more than up to the task and were used to effectively and safely clean the trains without causing damage to surfaces, unlike other products. Triple7 Heavy Duty is a completely bio-based quick break degreaser and contains no hazardous chemicals, so it is safe for humans and the environment. In fact, this product is Good Environmental Choice Australia (GECA) accredited and HACCP Food Certified. It is 100% biodegradable and the runoff will not pollute waterways when disposed of within usage guidelines. And unlike most standard acid-based chemistries, Triple7 Enviroscale Plus is free from harsh substances such as hydrochloric acid or sulphamic acid. It is also made from a purely botanical formulation, so it isn’t harmful for humans, plant and animal life, and the environment. Triple7 Heavy Duty is a powerful quick break surfactant system and botanical-based solvent that removes even the toughest oil and grease build-up, as well as dust, dirt, and other matter without damaging the surface being cleaned. Because it has no Hazchem rating, businesses can save on transportation, storage, handling, and disposal costs. The product can also be used for a number of different applications. With its unique and effective surfactant technology Triple7 Enviroscale Plus easily and successfully removes scale deposits without corroding equipment. 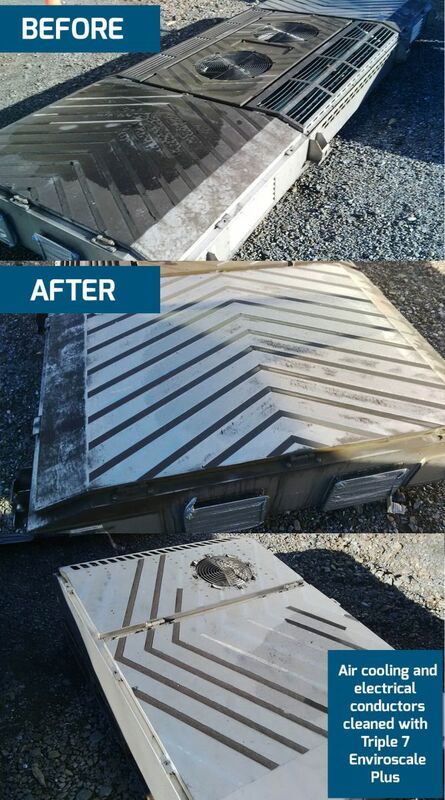 Triple7 Enviroscale Plus can often be used to remove foreign build-up from equipment without dismantling it due to its low-corrosion formula and low flammability, significantly reducing labour costs, down time, and loss of production. Furthermore, the product can be used to effectively clean at room temperature, eliminating heating costs. Because Triple7 Heavy Duty is non-corrosive, it is safe for use on various surfaces such as metals, rubber, and virtually all other surfaces, eliminating the need to stock up on different kinds of cleaning solutions. What’s more, residual Triple7 Heavy Duty acts as a rust inhibitor and is a natural lubricant. Unlike most acid-based cleaners, it powerfully cleans without damaging hard surfaces, seals, rubbers, equipment and pipework systems. It is a versatile cleaner that can be used for a variety of applications including duct cleaning, condensers, boilers, pumps, and pipework, etc. KiwiRail is the largest rail transport operator in New Zealand, offering rail freight and passenger transport services as well as ferry operations. It is committed to providing excellent services to customers, and a zero-harm workplace for personnel. Furthermore, the company aims to deliver services in an environmentally-sustainable way. The health and safety of its customers and personnel is paramount to the company. KiwiRail operates a large fleet of trains, carrying countless passengers and goods on its railways every day. Regular cleaning and maintenance of its assets are an essential part of their commitment to look after the wellbeing and security of their customers and workforce. Sourcing for safe, environmentally-sustainable, and eco-friendly cleaning and maintenance solutions will bring them closer to their goals. Traditional chemicals, while effective at removing grime, grease, or limescale build-up, contain harsh, hazardous chemicals that can corrode equipment and harm the people exposed to them. Over time, these chemicals can damage equipment enough that will necessitate costly repairs or replacement or cause serious injury to the people working with or handling the product. Moreover, standard cleaning agents produce a range of unpleasant and harmful effects on the environment. The harmful chemical ingredients in these solutions eventually make their way into waterways, such as streams and rivers, and end up in the sea through direct runoff or leaching. Envirofluid demonstrated how Triple7 Heavy Duty and Triple7 Enviroscale Plus works to efficiently and safely do their jobs. Triple7 Heavy Duty was used to clean trains of general soiling and proved to be just as, if not more, effective as traditional cleaning agents. Additionally, the product may be filtered of contaminants and reused or recycled for long-term cleaning systems. Best of all, the runoff is safe to leave with the track-based drainage systems and will not harm the environment. These benefits, combined with improved cleaning results and protected worker health, make Triple7 Heavy Duty the right choice for the task. Triple7 Enviroscale Plus proved equal to the task of cleaning Perspex light cover, electronic signage, and roof conductor for copper residuals and general contamination from overhead wires. The result was easy removal of said contamination and residuals without the risk of corrosion and damage. Both products are highly-concentrated – a little goes a long way, making them very cost-effective. They are easy to use and with maintenance crews spending less time achieving greater results.